Home automation tech advances, but is it for real or just a Jetsons dream? The dream of a fully automated home has existed for a long time. Since the early 20th century people have dreamed of computerized abodes complete with self-operating dishwashers, blinds that open as the sun rises and robot maids. Fast forward to the present and we're not much closer to a self-operating anything, save for the Roomba that crashes repeatedly into the wall.True home automation has been widely slighted as an impossible dream that rears its useless face at CES every year. Like clockwork, the technological pipe dream showed up again at CES 2014. Although we were a bit skeptical, this year we heard the a number of announcements and saw quite a few additions to the auto-home landscape. The tech came from more than a handful of names big and small, and we saw a number of the promising innovations that could soon lead to the realization of the dream of a fully automated home. One of the earliest CES events fell on LG's shoulders, and during its Monday morning press conference the Korean firm LG introduced HomeChat. The service was put together in partnership with the Line messaging app promises to let users text their LG washing machines and ovens, giving the appliances instructions about what to do. What's more, the same smart appliances would then text you back in a human fashion, sending messages like, "I'm going to miss you." Besides getting into eerily creepy HAL 9000 territory, the technology would allow smart appliances to more easily understand commands without needing homeowners to learn specific machine prompts. David VanderWaal, director of brand marketing for LG home appliances, gave an example that users could text their washing machine, "What are you up to?" and it would respond, "I'm just finishing the spin cycle, I won't be long." Positioning the technology as something more than a competitive novelty to win over Whirlpool customers, VanderWaal posited that "over half of today's home owners say their current appliances don't give them everything they want and only 12% are comfortable with showing their kitchen to visitors." Of course, these percentages don't explain whether these homeowners are fed up with dryers because they wrinkle their sheets or it's smart appliance related issue. LG wasn't the only one at CES 2014 to announce some home automation plans. In a more security oriented fashion, ADT said it wants to take care of everyone's home as well as digital safety. 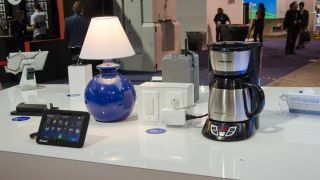 At the show, ADT showed off a sweeping list of upgrades for ADT Pulse, its cloud network. Chief among its new services was a mobile app that understands voice commands to manage home security and automation needs. Ray North, director of ADT Service Platforms, told TechRadar beyond understanding vocal commands, it recently implemented a Pulse integrated security box that can already communicate with up to 200 devices. This includes a number of smart devices, including smart thermostats, smart switches, Z-wave enabled locks (Z-wave is a wireless communications protocol designed for home automation), cameras, or touchscreens to build a connected home. Down the line ADT believes home automation can become as intricate as using geofencing technology to track when users come home with their car to automatically trigger the garage door, turn on the water boiler through a smart thermostat, and switching on lights. While full home automation technology isn't quite there, we spoke with ADT's Senior Vice President and Chief Innovation Officer Arthur Orduña who agreed the automated home dream has been a long time coming. "A lot of [home automaton has] been point-to-point kind of solutions," Orduña said. "The real issue has been making them all integrated and then you can make it really easy to get some point of ubiquity and you'll actually have a real market."